Micromeritics AccuPyc II 1340 and GeoPyc 1360 Pycnometers can work in tandem to help optimize process design, manufacturing, and drug product performance of pharmaceutical powders and solid dosage forms. GeoPyc 1360 Pycnometer by Micromeritics. Pharmaceutical scientists realize that many of the physical, mechanical, and pharmacokinetic properties of tablets are influenced by the basic settings of a tablet press. The choice of tablet press operating conditions and tablet characteristics such as size, shape, and porosity influence the dissolution behavior of the tablets that are produced. The GeoPyc uses a quasi-fluid displacement medium composed of microspheres having a high degree of flowability that do not wet the sample or fill its external or internal pores. A variety of sample chambers is available to accommodate a wide range of sample sizes and shapes. 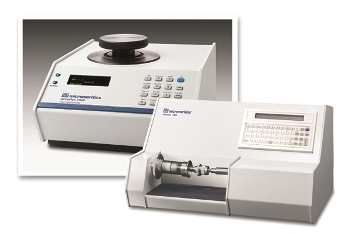 In business for over 50 years, Micromeritics is a leading supplier of materials characterization analytical laboratory instrumentation and services. The company manufactures a broad line of automated laboratory instruments that measure physical characteristics of powders and solids for fundamental research, product development, quality assurance and control, production, and process control applications. Measurements obtained include particle size, surface area, pore volume, pore size and pore size distribution, material density, catalytic activity, and temperature-programmed reactions.